Me to friend over text about Eaze: Did you know there’s an SF startup promising to deliver medical marijuana right to your door? Her: Wuuuut??? That’s a first. Me: I don’t have a license to buy that sort of thing. Her: Which is why you turn to me. Her: WaaS Weed as a Service. Brill. Should I get Berry White or Mango Kush? Her: Okay, app verified I’m legal. Her: Now my ETA is 4 mins??? But I didn’t order anything yet and it’s weird. Update from her: Wait, I’m still pending? Her: You know there’s a lot of excitement about this at the office right now. No one’s going to lunch until our delivery is here. I’m getting some phat nugs. Me (a few minutes later): Where is delivery now? Her: 5 mins. I’ve emailed support. I have no idea what I ordered or that I checked out. Her: Now it says 4 mins. The tension is running high in the office. Her: Says he’s a block away. Me (14 mins later): Okay now? Her: The dolphin is in the jacuzzi. 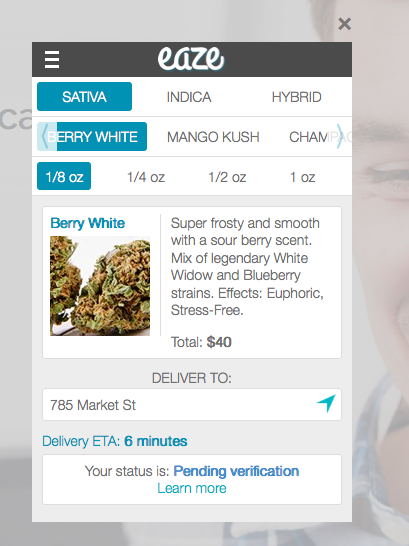 Started by former Yammer sales director Keith McCarty, Eaze is an Uber-like medical marijuana delivery service with an app that tells you when your “caregiver” (that is, delivery driver) will arrive with the goods at your door. The drugs can only be delivered to those with a legal medical marijuana card. Once a user is verified that they have a legal license to buy in the state of California, they can choose from a variety of strains and quantities. “When I told my parents about my idea for Eaze, they accused me of becoming a glorified drug dealer,” McCarty says. He told me he actually started the service because of a marijuana strain called “Charlotte’s Web” intended to treat children with epileptic seizures. Eaze spokesperson Caroline Vespi says choosing to make this a delivery service rather than a dispensary helps make taking the medicine more convenient to patients. She says Eaze has partnered with dispensaries around town for now and that prices through Eaze are comparable to those you might find in those dispensaries. An 1/8 is about $50, for example; there’s no additional fee for delivery to a patient’s door. The plan, says Vespi, is to carry out the service in SF for now and then later roll it out (heh) in Southern California as well as Colorado and Washington. “We’ll deliver both medical and recreational marijuana there, according to the laws in those states,” she says. So those in Colorado will have to be at least 21 years old in order to become Eaze customers. “I get why people might have a negative initial view of the marijuana business. It’s been that way in our society for a long time, but times are changing,” says McCarty. The New York Times editorial board asked for a lift on the marijuana prohibition just this week. While the White House disagreed with the Times’ ask, there’s a lot more support for legalization than there ever has been in the U.S.
A recent Pew Trust survey also indicates that the majority of Americans (54%) now favor the legalization of marijuana. 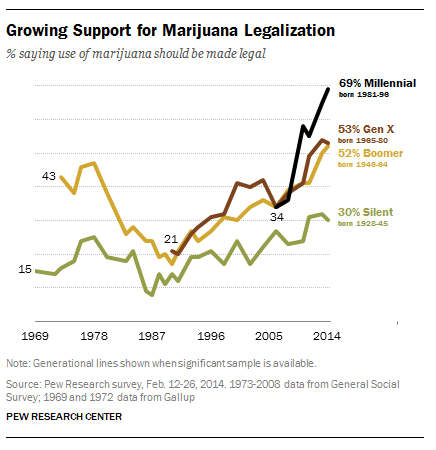 Support for legalization is even higher (69%) among Millenials.